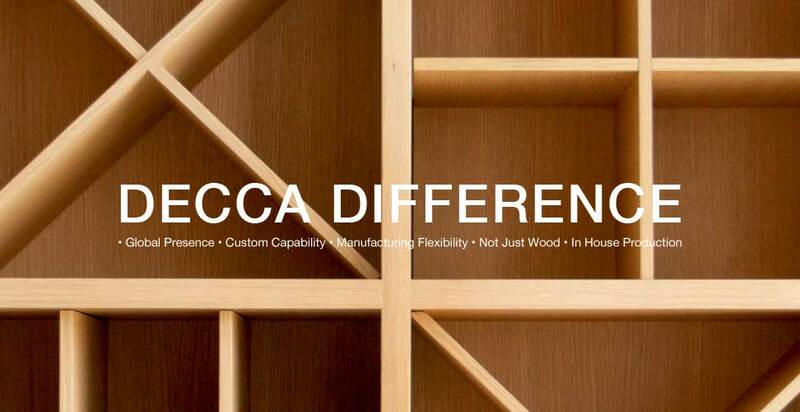 Recognized internationally for its architectural woodwork and furniture, Decca collaborates with outstanding architects and designers from Europe, the U.S. and Asia to create custom solutions for interiors that inspire and endure. We maintain offices and showrooms in major cities around the world, supported by our internal sales organization and a global network of authorized dealers. Today, Decca is positioned to meet the needs of local businesses and multi-national companies whatever the project or locale. The people of Decca are as diverse as our clients. We employ dedicated and creative people around the globe who enrich our company with their unique talents and backgrounds, bringing Decca a deeper understanding of cultural perspectives and client needs and preferences. Decca has made a significant investment in people, technology and advanced systems to ensure that our staff is highly trained and our factory is state-of-the-art. Our team of expert engineers, together with practiced craftsmen and sophisticated machine technology, enable Decca to translate any design concept into a flawless piece of woodwork or furniture. We can move quickly to create a custom product that fulfills the client's aesthetic or functional requirements down to the last detail. Decca accepts orders for any type or size of project from one piece to several thousand. We are also able to offer customers both millwork and furniture, allowing the designer to easily coordinate interior woodwork and furniture, including veneer color, hardware and other details from the same source. Today, metal has become part of an element in many furniture designs. Decca is one of the few companies to provide both wood and metal craftsmanship. Without the need to subcontract the metal work, our metal department allows us to control quality and to meet unique and challenging design requirements. It is matter of pride that every piece is built in our own factory. Decca is one of a very few furniture companies that can claim 100% in-house production. We are able to offer real assurances of quality because we "Build", rather than assemble, our products. This gives us absolute control not only on quality but also delivery time.